The mobility and displacement of the Black body, from port to holding cell, to ward and out, is a history that is embedded in our communities socially, culturally and geographically. Alluding to feelings of pain, otherness, power and triumph, "she was here, once" features work that illustrates a moment of remembrance and reflection on the women who have roamed these spaces before us. 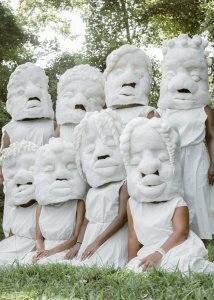 In summer 2018, artist Nastassja Swift organized a collaborative workshop and public performance in her home city of Richmond, Virginia. 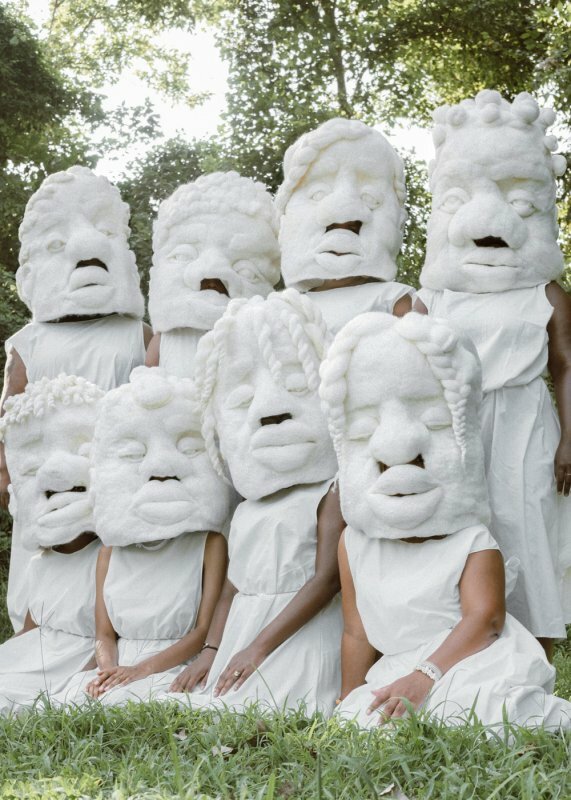 Using a range of choreographed movement, sound, and solidarity, eight Black women and girls, wearing large needle felted wool masks, traced the ancestral footprints of the arrival of the Black body in Richmond. The 3.5 mile walk began in Shockoe Bottom (the site of the importation of slaves into Richmond, and one of the largest sources of slave trade in America) and concluded in the Jackson Ward neighborhood (one of the largest Black communities in Richmond). The multi-layered piece has produced a short film, mini documentary, photography, and performance masks, on display in her solo exhibition, "she was here, once" in Lane Hall. Lane Hall Gallery is open to the public weekdays from 8am - 5pm. Class visits are encouraged. Accessibility: Ramp and elevator access at the E. Washington Street entrance (by the loading dock). There are accessible restrooms on the south end of Lane Hall, on each floor of the building. A gender neutral restroom is available on the first floor. Contact Heidi Bennett, IRWG Event Planner (heidiab@umich.edu) with questions about this exhibition.